future” as part of a touching commemoration ceremony. Some of the "Letters to the Stars" are represented on this page. 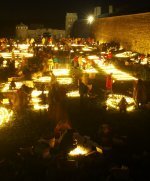 During the “Night of Silence” on May 7, 2005, thousands of people lit candles in front of the Mauthausen concentration camp, one for each of the 100,000 killed. 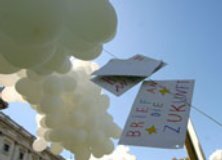 In November 2003, Jewish and non-Jewish students assembled on Vienna’s Seitenstettengasse to lay pages with names of Austrian victims in front of Vienna’s main synagogue. On May 9, 2004, 20,000 gathered for a student-planned commemoration of the liberation of Mauthausen. In a field outside the camp, students planted sunflower seeds to create a “Field of Remembrance”. May 5, 2006 – 25,000 people, among them 15,000 high school students, gathered at Vienna’s Stephansplatz during the ‚National Day of Remembrance Against Violence and Racism’. In memory of the 80,000 Austrian victims of the Holocaust, 80,000 white roses were placed behind a symbolic barbed wire fence. After a dignified and touching commemoration ceremony that included survivors, students and artists, project participants carried roses with the names of victims of the Nazi regime to the victims’ last Austrian addresses before their deportation and murder. “Flowers of Remembrance” was a unique event worldwide.